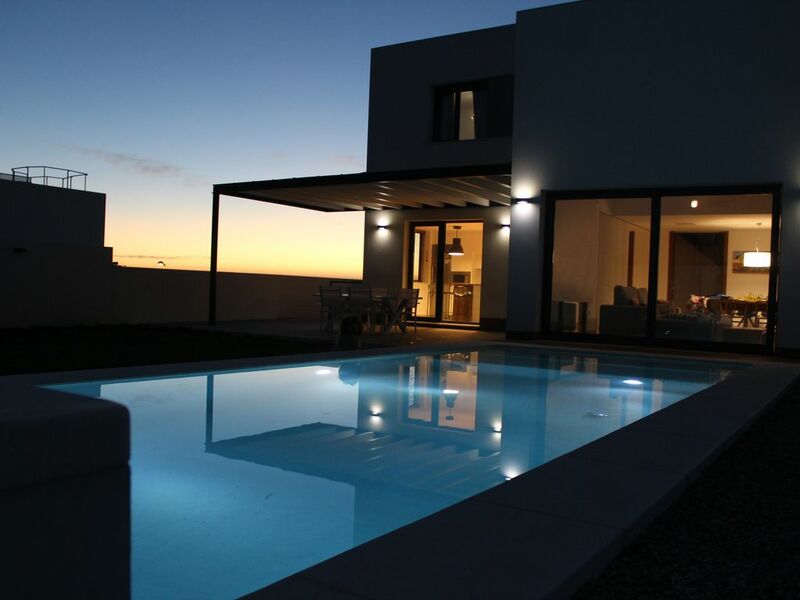 Luxury house with unbeatable views of the sea, in one of the most privileged urbanizations of the town of Conil de la Frontera. This urbanization has large gardens, located a few minutes walk from the wonderful beach of Fontanilla (with the famous restaurant of the same name). New luxury house with marvellous sea views, located in one of the best neighborhoods in Conil de la Frontera, sourrounded by gardens. Just a few minutes walking distance from the Fontanilla Beach, where you will find the best restaurants in town. Without using the vehicle we can enjoy a sports complex with paddle tennis courts, tennis courts, soccer fields, basketball, heated indoor pool, playground for children, guided activities. As well as medical centers, pharmacies and supermarkets. Next to our house, you will find a sport complex with paddle and tennis courses, soccer, basketball, indoor swimming pool, children's area, and more activities; as well as Medical Center, Pharmacies and some supermarkets. In Conil we also have a wide selection of bars and restaurants, which make it an excellent choice both day and night. Lower level: Parking space for two vehicles. Entrance, which on the left leads to a large living-dining area from which we can see the pool and its water curtain, with access to the terrace and garden. For the furniture the natural oak has been chosen, being furnished with three-seater sofa, two armchairs, four chairs, coffee table, two-person puff, Smart TV, satellite TV, fireplace. The dining table measuring 1.90 X 0.95 meters can accommodate 6-8 people. The kitchen open to the living room is fully equipped with fridge-freezer, induction hob, microwave, oven XL, dishwasher, washing machine, kitchen robot, television, work table in natural oak of more than three meters, having access from the kitchen to the terrace and the garden. To the right of the entrance we have a bedroom with double bed (1.50 x 2.00 m) equipped with built-in wardrobe and TV, and a bathroom with thermostatic shower. Upper level: We find the master bedroom with a double bed (1.80 x 200 m), television and large dressing room. Double bedroom with two beds (0.90 x 2.00 m) with wardrobe and tv. Double bedroom with two beds (0.90 x 200 m), wardrobe, television. Bathroom with thermostatic shower. Conil offers a wide range of leisure and sports activities, located in a unique setting in the South of Spain, surrounded by pine forests and the Atlantic Ocean. Apart from being an ideal place for any nautical sport, you can go cycling or hiking, horse riding or just enjoy a walk along the kilometer-long beaches of fine sand. A walk through the narrow streets of the old town reveals the historical roots of this beautiful town. The typical low and white houses with their beautiful patios, the city gate and several towers, the Baroque Church and the recently reconstructed Monastery, all are well preserved testimonies of the different historical periods that this town has lived. The gastronomic offer of Conil is delicious and varied, with dishes made with fresh local products.